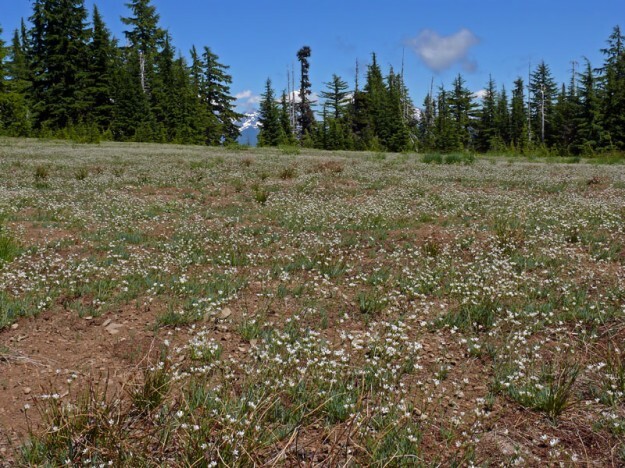 This terrific hike alternates between old growth forest and large sloping meadows, then reaches a rocky ridge with interesting plants hidden on the north side. As the trail continues, it passes through a dry opening filled with buckwheats and tiny annuals. This is an especially good area to look for butterflies although they are usually abundant in all the open areas. At an intersection in a floriferous meadow, head to the right to switchback up to the large open summit. Follow the cairns that help identify the trail as it crosses the summit to the far side where there is a great view of the Three Sisters from the top of a massive cliff. Binoculars will help to see the many interesting plants growing on the rocks below. If you have time, be sure to check out Quaking Aspen Swamp down a short trail from the same trailhead. Take Hwy 126 east past Blue River and milepost 45. Turn right onto Road 19, The Aufderheide. Keeping right, follow 19 for 3.3 miles until you reach the Cougar Reservoir Dam. Turn left onto Rd. 1993 and cross the dam. Follow 1993 for 2.7 miles of pavement and another 9.3 miles of gravel to a trailhead on the right. The trail to the right goes to Lowder Mountain (to the left goes to Quaking Aspen Swamp).